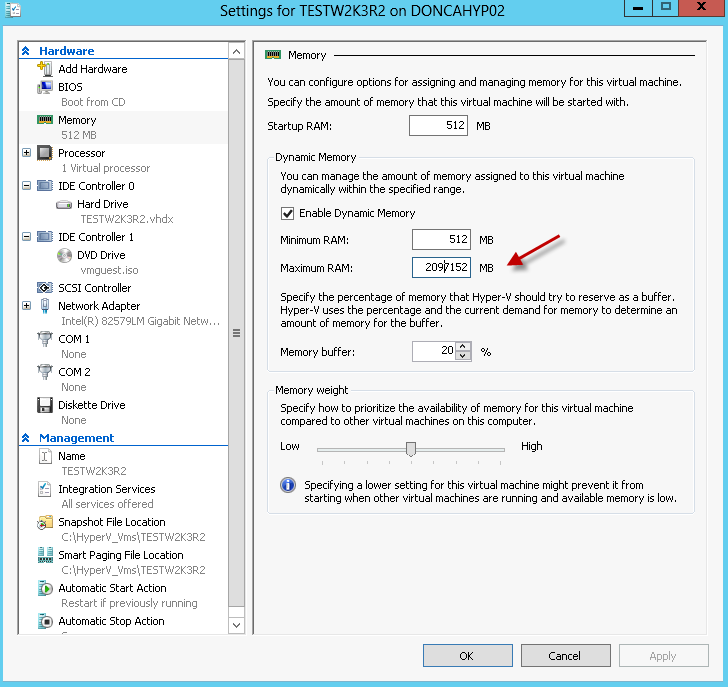 Windows 8 Hyper-v 3 New Dynamic Memory testing!! We all know Dynamic Memory feature in Hyper-v R2. This is quite argument point between Vmware and Microsoft. Vmware claims they have Memory over committing, memory sharing(schedule not real time), memory paging and memory balloon technology. Well, Personally, I have to say Vmware has done great job to allow more VMs memory consumption then what a host can hold. It is hard to do it without knowing OS core to reuse the memory. Microsoft, on the other hand, has Dynamic Memory. 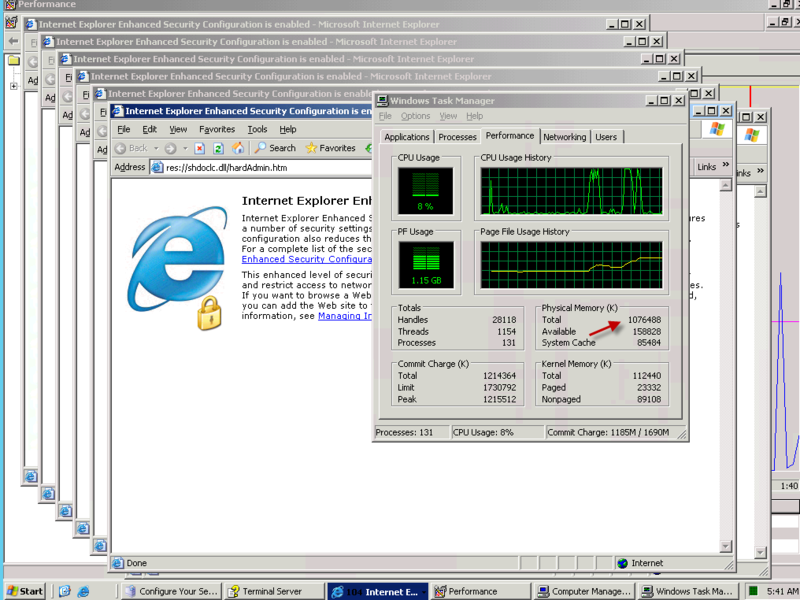 It allows you to “Dynamic using memory” by setting up lowest memory and maximized memory for each vm. Well, to be honest, I’m not very interesting about this tech since it’s very similar as what Vmware does. Now, thing is completely different from Hyper-v 3. 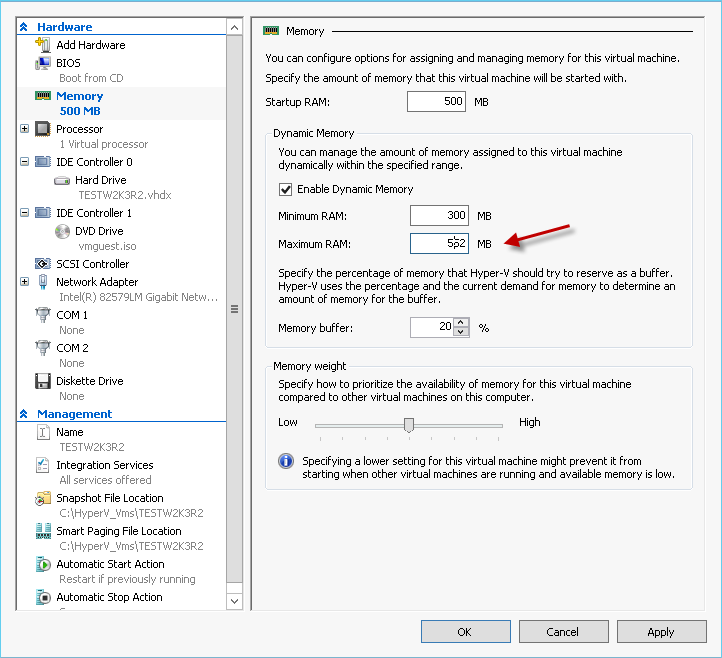 You can increase your vm memory on the fly! Yes, Vmware can do same thing long time ago. I used to write a post about it. However, it can only happen to Windows Datacenter version. Vmware does that by physically plug in virtual memory DIMMs into OS hardware. However, only Windows Datacenter level has capability to pick them up and add them into OS on the fly. Hyper-v 3 does that with almost every Microsoft system. Following is the list. Windows Server 2008 R2 Standard and Web editions Install Windows Server 2008 R2 SP 1 in the guest operating system. Install Windows Server 2008 R2 SP 1 in the guest operating system. Upgrade the integration services in the guest operating system to the SP 1 version. Installing Windows Server 2008 R2 SP1 is the recommended method because it provides the added benefit of installing all updates included with SP1. 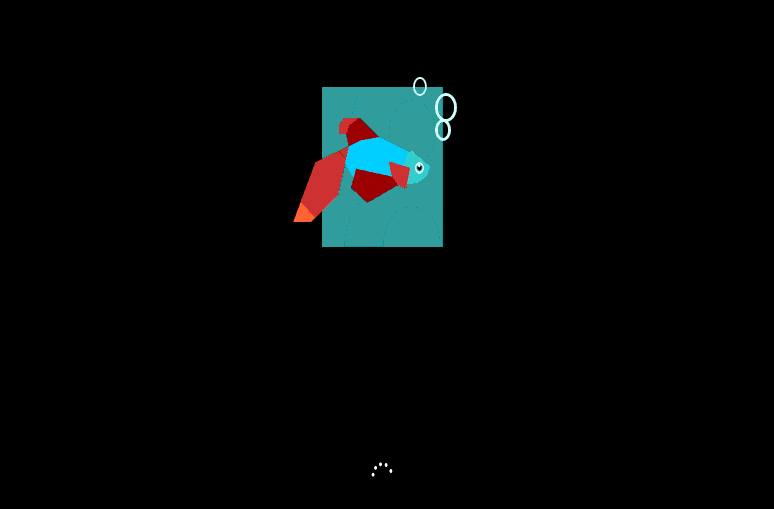 Install Windows 7 SP1 in the guest operating system. Upgrade the integration services in the guest operating system to the SP1 version. Installing SP1 is the recommended method because it provides the added benefit of installing all updates included with SP1. Windows Server 2008 with Service Pack 2 (SP2) Standard and Web editions (32-bit and 64-bit) Upgrade the integration services in the guest operating system to the SP1 version.Apply a hotfix as described in article 2230887(http://go.microsoft.com/fwlink/?LinkId=206472). Windows Server 2008 with Service Pack 2 (SP2) Enterprise and Datacenter editions (32-bit and 64-bit) Upgrade the integration services in the guest operating system to the SP1 version. Windows Vista with Service Pack 1 (SP1) Ultimate and Enterprise editions (32-bit and 64-bit) Upgrade the integration services in the guest operating system to the SP1 version. Windows Server 2003 R2 with Service Pack 2 (SP2) Standard, Web, Enterprise, and Datacenter editions (32-bit and 64-bit) Upgrade the integration services in the guest operating system to the SP1 version. Windows Server 2003 with Service Pack 2 Standard, Web, Enterprise, and Datacenter editions (32-bit and 64-bit) Upgrade the integration services in the guest operating system to the SP1 version. I tested both on windows 2008 R2 SP1 and Windows 2003 R2. The result is the same. As long as you install “Intergration Services Setup Disk”, you will be able to increase memory on any VMs on the fly! First, I created a VM and go into settings. This is the default settings of maximum memory settings. It has nothing to do with your host memory. It’s just maximum figure of Hyper-v 3 can handle. We don’t want Hyper-v to handle all memory. so I changed this figure to 512MB also changed start memory to 500MB like following picture. Then, I restarted W2K3 and you can see how much physical memory it has. Please be aware this physical memory is just figure of minimum memory figure. It will increase with how much memory you consume. Now, let’s change the maximum memory figure on the fly to 1GB! At Hyper-v 3, you can increase maximum memory but you can’t decrease them on the fly! You do can decrease minimum memory memory on the fly although I don’t see much point here. Hyper-v 3 supports balloon technology as well. The smart-page feature may contribute some scenarios with HA. But I haven’t got time to test it.